I hope that you all enjoyed the first posting of Everyday Innovators last week. I’ve received some good feedback — please continue to let me know your thoughts each week so my posts are interesting and informative. Today, I’m talking about listening. For me, that means getting out of the office and listening to our patients and our staff about what is working well at UMass Memorial and what needs to be improved. There is power in listening, and it’s something we can always do more of. 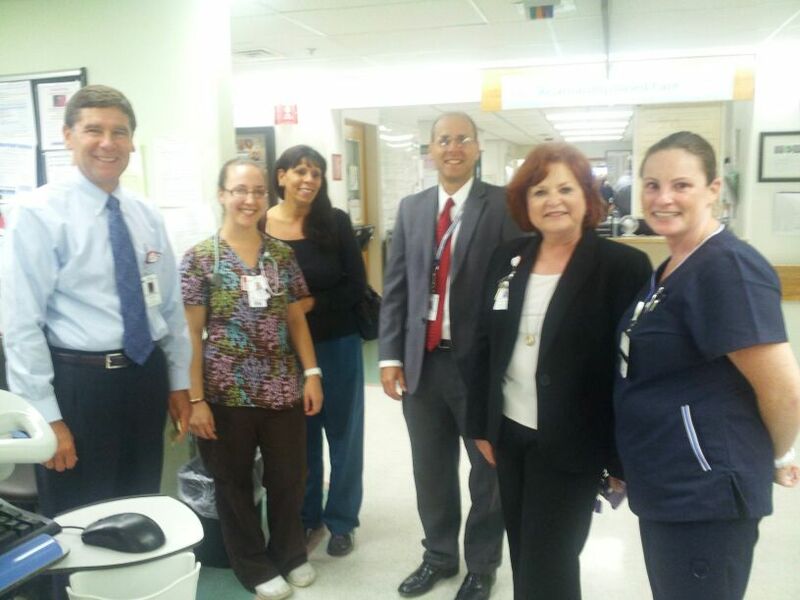 One of the main reasons I write this blog is to hear back about the great work you are doing across our organization, whether it’s from “the front lines” – in the clinics and on the patient units – or in the support areas, such as finance, human resources, marketing, or in our cafeterias. All of our work contributes to the patient and family experience in one way or another and we can all be thinking about ways to improve how we provide the care and services that make us the best place to give care and to get care. Now, I’m taking listening a step further. We have a great team of executives at UMass Memorial who make tough decisions everyday, but when it comes to providing health care, great decisions can’t consistently be made from a board room or by sitting through a PowerPoint presentation. In an effort to shorten the distance between the leadership decision-making process and the caregivers at the bedside, the management team is now taking part in Leadership Rounding on the inpatient units. Leadership Rounds. 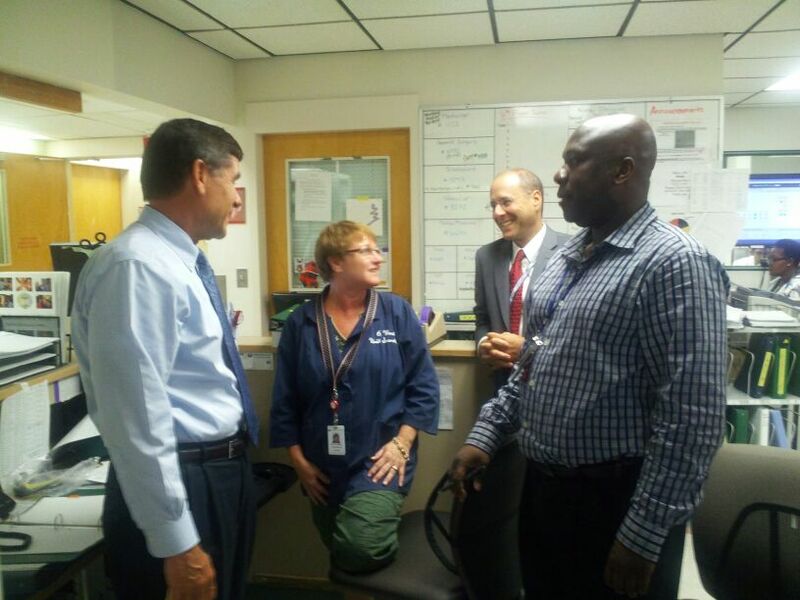 At UMass Memorial Medical Center, President Patrick Muldoon and Doug Brown, senior VP and chief legal officer, check in with unit clerks Diane Wassel and Eric Darko on 6 West, University Campus. Many hospitals across the country have shown that managers who spend time listening to and connecting more directly with frontline staff, care delivery process and patients themselves gain a more thorough understanding of their hospital. So don’t be surprised when you see members of the leadership team at the point of patient care. Talk to them. Tell them what is working and where we need to make some change. They’re listening to you and our patients! I agree wholeheartedly with this sentiment. If you have additional thoughts on how we can better engage with staff and patients, please drop me a note…or talk with your manager about how to incorporate an idea board into your regular department meetings. I’m going to leave you with a video. Meet Trevor, a young man with a unique perspective on his many medical conditions. (He actually makes a convincing argument on why he recommends type 1 diabetes!) Trevor is not a patient at any of our hospitals or clinics, but he certainly could be. What I really like about this video is the way that Trevor expresses in no uncertain terms how he wants to be treated as a patient. It should cause all of us to stop and think about what it means to be lying in that bed or sitting in that exam room. So listen to Trevor today, and consider ways that we can do a better job listening to all of our patients tomorrow. This kid is going to go places! Pure and honest! Yes! Listening is essential; especially in our world of constant distraction. I work in IS and would love to take part in the rounding. So great to see leadership getting out. I think it would be great for nurse leaders to take an assignment on my unit from time to time, that would really be frontline and keep us all in the loop in how we deliver patient care. Wow! What a critical thinker he is! Love his brilliance and honesty about diabetes. Truly motivational.